Kids love to get on their bikes. There are lots of ways to learn to ride a bike, and become a confident cyclist. Here's some great advice about how to help your child get started on a bike. Balanceability is a great way for young children to get started on two wheels. Sessions are organised at leisure centres. 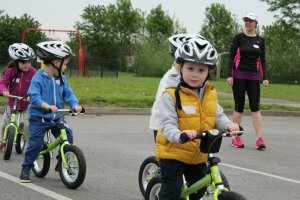 Most Primary Schools offer cycle training, and some have 'bike clubs' after school to teach skills and give confidence. Ask at school, or contact your local School Sport Partnership. Go Ride is the British Cycling programme for junior cycling opportunities with clubs. Find your local Go Ride club here. If they don't offer tuition for complete beginners, they will probably be able to point you in the right direction locally. It's OK to stop - or walk! Many people make the mistake of believing that cyclists never stop, or walk. This is not true. It is perfectly acceptable to have a break in your ride - a café stop, or a short rest. You're much more likely to stick with it, if you start slowly, make it enjoyable, and build up gradually. 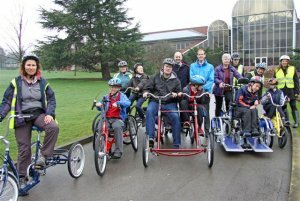 Cycling is a great group activity. Find a friend, a beginners' group, or an app! Evidence shows that people who enlist the support of a friend or join a beginners cycling group (such as Breeze for women), are more likely to stick with it, and succeed long term. Cycling apps, freely available to download, will help you to see the progress you're making. They will also show you routes that other people are riding, and give you ideas of where to go. There are lots of cycling apps. There are lots of great apps that will help you to plan and log your rides, and develop a supportive community around you. They allow you to see how far you've ridden, compare progress with friends and family and give an added sense of enjoyment. Strava and Map my Ride are two popular cycling apps, but there are many more on the market to keep you enjoying your time in the saddle. There's so much great information and advice out there for new and improving cyclists. Find some good social media pages to follow, subscribe to a cycling magazine, or have a browse on the internet. You'll find inspiration, helpful tips, and lots to keep you motivated.